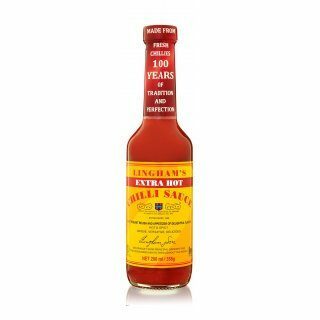 Lingham's Extra Hot - Just as good as the original, but hotter! Over a century ago in a far corner of Malaya four simple ingredients were crafted into this sublimely piquant sauce to satisfy the Edwardian penchant for hotter flavours and spiced foods. Today it is prepared in exactly the same way using only the very best fresh red chillies, our quest still being to make your everyday fare taste better. Our Extra Hot sauce is made with the pepper of choice for Chilli lovers - the ripest, reddest Birds Eye Chilli to deliver a distinctive punch of heat in a deliciously balanced sauce. Lingham's - perfect for when you just want that little something extra from your food, try it in: Marinades, Stir frys, Soups or Beans on toast. Splash it on mash, jacket potatoes, noodles and pasta. Ingredients: Sugar, Red chillies (34%), vinegar and salt. Forget what all other sauces claim, this is the hottest chili sauce around. This is only for the seriously adventurous. This is very hard to get in supermarkets as the turn over is too small for fast turn over due to the fact that so few people can "take" the effects of this sauce. This sauce is absolutely delicious (if used with caution) on pizza.